When I went to Okayama city by train the day before yesterday, I took this picture. 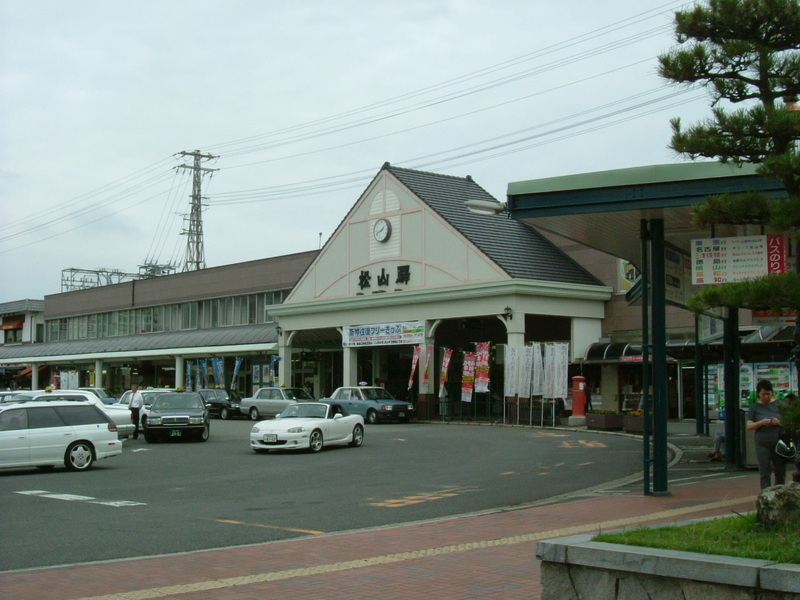 It is Matsuyama Station of JR (Japan Railways). The weather was cloudy and the picture is not bright enough. The station is shabby for the scale of the city. Reconstruction of the station has been in the planning stage for these past 10 years. Things are not going well because of various factors. It takes the same amount of time (about 3 hours) to travel to Okayama city by train and by car. I usually use a car because I can start whenever I like, but I chose the train today. I had to stay 2 successive nights at my hospital. I got tired and a little sleepy. It was the reason why I chose the train. I fell asleep just after leaving and was jolted awake by a train conductor at Okayama station. I had 3 hours' good sleep. I recovered completely. My old friend came back to Okayama University as a professor this April, where we graduated from a quarter of a century ago. I was happy to hear that and went to Okayama city to see him and say "Congratulations!" We met for the first time in 25 years. We invited a teacher who taught us a lot of valuable lessons when we were university students. He is about 80, and has an eye problem. We felt sorry to see him because he was very active and passionate or crazy about many things; skiing, hunting, bowling, water-skiing, baking cakes and teaching young people,,,in those days. I had thought he would never get old. However, the story of my old friend was uplifting. He had gone to Indonesia for three years to study malaria just after getting his PhD in postgraduate school. In Indonesia he thought it was not enough to treat people one by one and he was eager to treat a whole area of people. He got to want to handle administration-related tasks. Consequently, he was warmly welcomed to the Japanese Health and Welfare Ministry after his research in Indonesia. After a while, he was sent to Geneva as a WHO official. Finally he began to work on the frontiers of world hygiene science. He was going to work there the rest of his life, but Japan didn't permit his desire. He didn't talk about this, but I imagine that Japan needed his ability. AIDS, SARS, Bird Flu,,,. He might be in step with the times. We had a common acquaintance. In about 1996, a classy middle-aged lady visited my house. She was a former American diplomat and the wife of the WHO Secretary General. 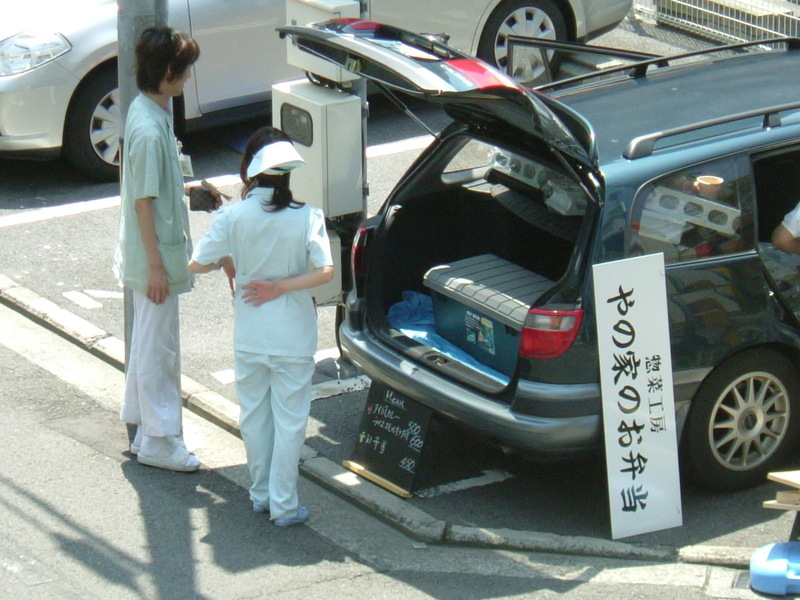 She had a strong interest in the Shikoku 88 temples pilgrimage and she was asking information about the pilgrimage using the CompuServe Bulletin Board Service. Shikoku is my home. I found her comments on the board but I just kept watching because I didn't have any confidence in CompuServe communications and I thought someone would help her. However, no one replied to her comments, so I tried to post my comment with my chin up for the first time. CompuServe was an American-based computer network service and very few Japanese access it, I thought. Anyway she actually came to Japan. I didn't know anything about her except her name until I met her. I had only imagined that she was a kind of young backpacker. So, when I met her for the first time, I was very surprised at her Japanese and gentleness. She could speak Japanese very fluently. "Why?" "My husband is Japanese. I was a diplomat and learned some languages." "Wow..!" My parents' house is big and Japanese-style and maybe attractive for Americans. I proposed that she stay one night with us if she wanted. She replied that she'd like to, but she had an appointment with Mrs. Hilary Clinton in Beijing the next day and had to leave here that day. I was at a loss for words. "Have a teatime with Mrs. Clinton?! Who is this lady?" That year was the International Women's Year and the international meeting was held in Beijing. I talked to my old friend about these stories in more detail. The world might not be so large as we think. He showed me the miserable situations of the Third World. I'd like to do something if I can. Now I have three ball-and-chains, I mean daughters! After they are independent, my time will come! This meeting was a wake-up call for me. I must be more and more trained. I'd like to show you a graph of the changes in the Ishite-gawa Dam reservoir water. It's one of the pages in the municipal official website. It's written in Japanese and I'll try to explain it in English. The left longitudinal axis shows the rate of reservoir water. The vertical scale of it is written as a %. The right side is the amount of precipitation. The scale is in millimeters. The horizontal axis shows the month in each year. The blue line is the rate of reservoir water from April 2006 to March 2007. The Japanese fiscal year is from April to March. Anyway, the green line is in 1994, the drought year and the red line is this year. The bar chart of each color shows the precipitation of each month in each year. The stair-like line plot shows the average year. I think you can understand visually how serious our water supply situation is. I got up at about 6:30 this morning. The weather is clear. I walked my dog as a matter of routine. My house is 15 minutes' drive away from the center of the city, but is surrounded by greenery. My hometown is about 500,000 in population and is not such a big city. The scenery in the morning around here is very beautiful. I've no words for describing it, especially after the rain in the leafy month of June. The weather forecast I heard last night was saying, "It will rain tomorrow morning. The chance of rain is 70% in the morning." I expected a lot of rain because we, the citizens of Matsuyama city, are short of water. However the rain seemed to stop very early in the morning. I'm afraid of what will happen this summer. Very few patients came to see me this afternoon. That's why a nurse started to clean the OPD consulting room. She got round to the window screen. There were some insects and some other things stuck there and it looked so dirty. It was beyond her single resources. Eventually all the nurses started cleaning. My boss might be worried about the management of the hospital, you know, I mean few patients, low income, but I think it's good to spend a relaxing afternoon for a change. LPSW has just started today. The pressure of the water supply is being lowered from today. This is the first munincipal step to save water. It'll take a little longer to fill the bathtub, but it won't influence our daily life so much, the authorities say. I checked the website of the Japanese Ministry of Land, Infrastructure and Transport to see the status of the Ishite-gawa dam reservoir that supplies water to my city. Today's water storage rate is 53.8%, while it is 89.5% in an average year. We need a lot of water to plant rice just now. I'm afraid a drought has just started. If we didn't have enough rain now, we wouldn't be able to avoid cuts in the water supply. This summer is the season that we miss typhoons. Take a look at the picture below. 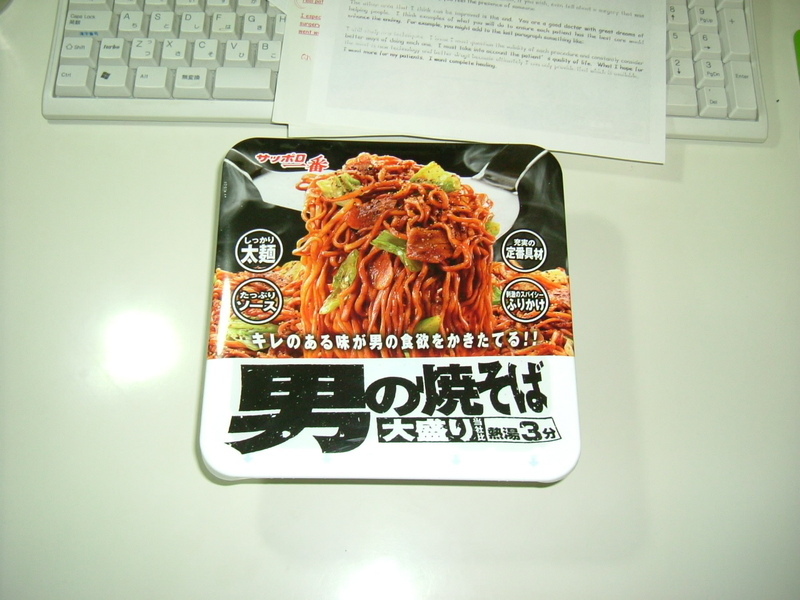 It shows an instant fried Chinese noodle. You can eat it in 3 minutes after you pour boiling water into the bowl. I often eat such instant foods in my office and I'm picky about those instant noodles. I have favorites, of course. Today I found a new instant noodle that you can see in the picture. The brand name is "Man's fried noodle". Not woman, but man. What does it mean? I got it without any hesitation. What is the man's taste like? The taste was very spicy and not my preference. It will be the last time I taste it. I think it will disappear from the store shelf soon. When I was making my morning rounds on the third floor, I happened to look out of the window. It was a nice day and a little hot. I really felt that I'd like to go out and ride my motorcycle. At that exact moment I saw two people walking to a car like ants gathering around candies. The car was a moving stall. The two people were my co-workers. It was more than one hour left until lunch time. They had sneaked out of the hospital and had been waiting for the opening of the stall. It was intersting and really funny that they didn't know that I, the head nurse, and another staff member were observing them from the 3rd floor. They must have thought they had successfully slipped out and no one knew where they were. The picture shows them and the stall that is getting ready to open. I didn't know about the moving stall, but the owner of the stall appears to be famous. The menu he presents is only two kinds. One of them is Thai-style vegetable curry and seems to be very popular. Anyway today's targets of the owner must have been my staff members and his tricks turned out to be completely successful. Next time he comes here, I'll try it. It appears that the two aircraft were in no danger. The man appeared to be in his late twenties. 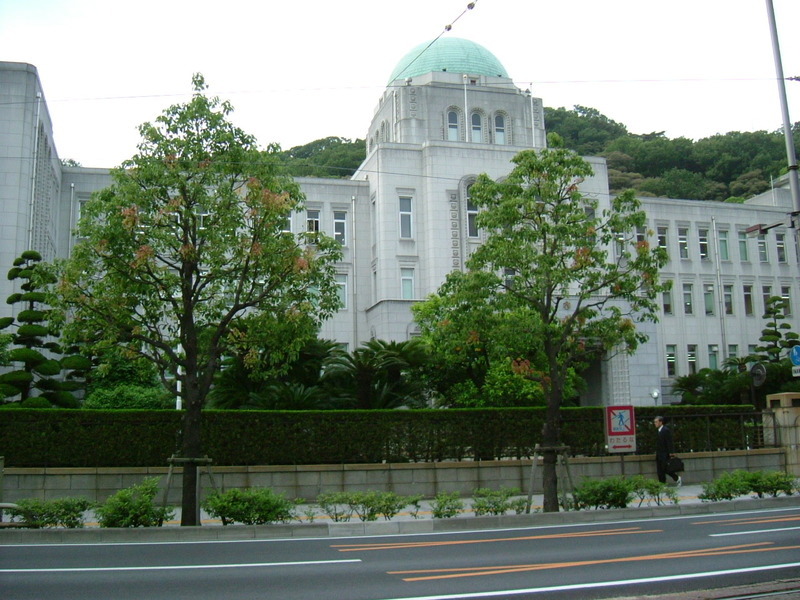 On the way home after work, I happened to stop at a red light in front of the prefectural office building. At that time I took a picture of it. What do you think when you look at this building. It is still in fact in use and at the same time it is a historical heritage building. This building is located in the heart of the city and many official facilities are near here. My hospital is one of them. This is at the base of the hill where Matsuyama Castle is located. I can't help recalling the Showa and Meiji eras when looking around this area. There is the measles going around in Japan though the country is supposed to be one of the developed countries. It's because of the Japanese Government's lack of policy. There are some cases of the measeles in Canada and the U.S. in a year and almost all of them are exported from Japan. Despite the fact that Japan has enough technology and money to produce vaccines, it delivered the virus to and fro. I'm bitterly ashamed. In our neighbor, Korea, the measles are completely eradicated now. They took secure measures towards the eradication of the measeles for some decades. The Japanese authorities, I think, must take some urgent steps to remove the measles virus from our land. I graduated from medical school a quarter of a century ago. Most students used to work as residents at the university hospital that they graduated from. They had to choose their major like general surgery, internal medicine, pediatrics, neurosurgery,,,, at that time. Once they selected their major, they had to study only their major. They didn't learn any other subject. It was the training system for new doctors in Japan. I wondered whether it was right? The human body is composed of many parts. Any single part can't be alive without the other parts. I thought that we, medical doctors, must have a wide knowledge about the human body, besides our specialities. When a pregnant woman becomes unconscious, is the reason always an eclampsia of the pregnancy? The other day, a miserable incident occurred in Nara prefecture. An obstetrician diagnosed a nine-month pregnant woman with eclampsia. I'm not sure, but he might not have known how to examine the unconscious patient. If he had examined her pupils, which is a fundamental procedure to all doctors, she could then have consulted a neurosurgeon. If that were the case, she might be alive now. Her coma was due to CVA. To get back to my original point, I left my university and became a resident in a middle-sized hospital in Osaka that is famous for adopting the American style of training system. As I expected, the training here was so hard, but I was able to survive these 3 years although I was admitted to hospital with colitis for a week. I met a few dozen residents from many places in Japan. They scattered across the country after finishing the resident period, but a few of them are good friends now. One of them opened his own clinic in Nagoya city a few years ago. I haven't had the chance to see him for more than 20 years. However, as I wrote a few times before, my second daughter started to live in Nagoya City this April. I made an appointment to see him. 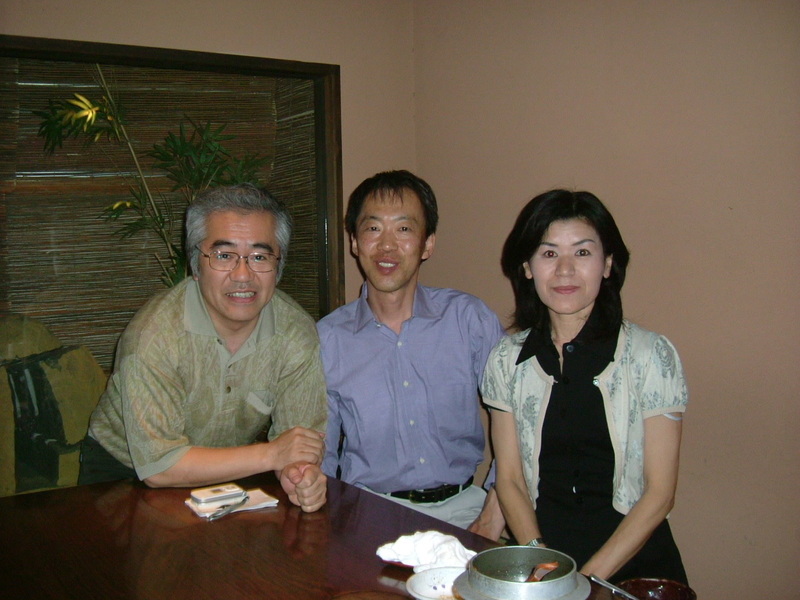 I, my friend and his wife, who was our co-worker in the same hospital, got together in downtown Nagoya City for the first time in 20 years!!. Only 2 hours was too short to talk about everything over the last 20 years. A former gangster who shot and killed a member of the Special Assault Team and injured a police officer, plus his own son and daughter, during a 29-hour hostage stand-off at his home in Aichi Prefecture, central Japan, surrendered to police in the evening on May 18th. This incident occurred near my second daughter's apartment. It was three km away from her. I was so afraid that this incident might influence her life because two universities and two compulsory schools for kids are closed and many inhabitants were prohibited from going out for two days around the scene, but that concern luckily proved unfounded. I had free air tickets presented by ANA (All Nippon Airways) at that time. The next moment I found myself making a reservation for a flight to Nagoya, my second daughter's city . I'm going to leave for Nagoya this afternoon. The weather has been sunny or occasionally cloudy lately. I mean, we have little rain these days. Matsuyama city, my hometown, experienced a serious drought like ten years ago. The citizens had to survive on little water for a month in the summer of that year. I'm going to write about the situation at that time. The municipal swimming pools and all school pools were closed. All sports gyms closed their pools and shortened their working hours. Matsuyama city is famous as the city of hot springs, but all the hot springs facilities were closed too. I couldn't wash my cars. The water for the plants in my garden was cut short. I went back and forth many times between my bathroom and my garden with a bucket of water to feed the remains of the bathwater to the plants. I had to use the restroom water for the plants. All the swimming beaches were closed to save the shower water. Authorities cut the water supply for each household for the most part of the day. You know, I put a big bucket in the restroom in my house for flushing the toilet. Anyway, I had a hard time during the drought. It's rice planting season around my hometown. As you know, rice planting needs a lot of water. The water in the resorvoir will decrease this season. My hospital has its own water well that was drilled just after the heavy drought, but the underground water will decrease unless the rain comes. The surgery needs a lot of water. I'm afraid that a serious drought has come again.